Originally published in Walter Magazine on April 2, 2018. 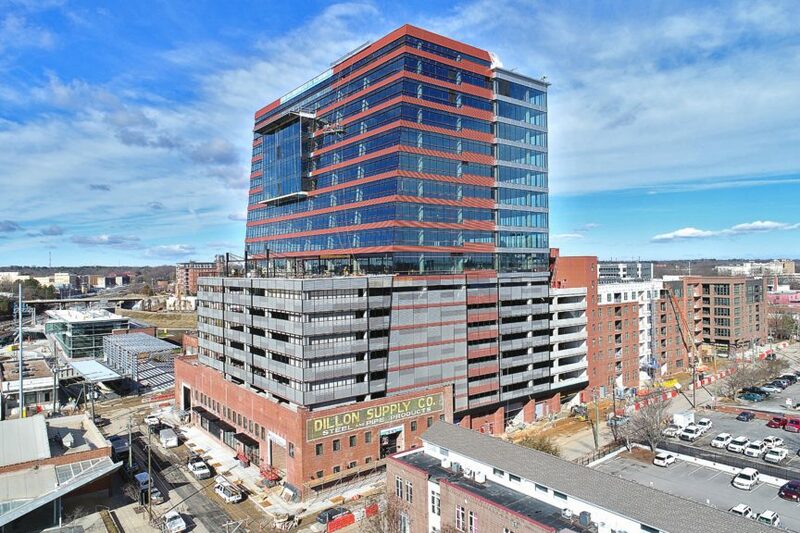 When 17-story The Dillon opened last month in Raleigh’s warehouse district, it revealed itself to be more than a glass- and aluminum-clad, mixed-use building. It’s also the product of an ongoing, collaborative relationship between two prolific Triangle architects. sensitive structures at Duke University, and a new wellness center now in the design phase for Jefferson’s “Academical Village” in Charlottesville, Virginia. As fellow Durham architect Phil Freelon of Perkins+Will says, their architecture is positive and long-lasting. It’s also rooted firmly in the modern movement. Paine learned about that as a student at Syracuse University, and Duda at the Yale School of Architecture, and prior, from 1972 to 1976, as an undergraduate at the N. C. State College of Design. Duda and Paine met while working in the New Haven office of César Pelli, who was also dean of the Yale School of Architecture. Pelli Clarke Pelli was, and still is, known for its towering buildings, mostly in glass and steel, around the globe. Among them: the 1975 Pacific Design Center in Los Angeles, the 1988 World Financial Center in New York, and the 1992 Bank of America Corporate Center in Charlotte. Paine had joined the firm two years after Duda, following a stint in Kevin Roche’s Connecticut office, where he’d worked on the John Deere corporate headquarters in Moline, Illinois. Roche and Pelli had a shared DNA – both had worked in Eero Saarinen’s post-World War II office, recasting perceptions of American modernism. Among Saarinen’s projects were the St. Louis Arch, the TWA Terminal at Kennedy International Airport in New York, and Dulles Airport in Northern Virginia. Through Pelli and Roche, the modern aesthetic trickled down to Duda and Paine. By 1997, the pair was making the rounds in the Triangle, introducing themselves to potential clients and architects in the area, and offering to collaborate at the drop of a hat. The assignment for The Dillon was multifaceted. Already under way was Clearscapes’ adjacent Union Station, in need of 300 of The Dillon’s planned parking spaces. The client wanted to maintain a brick façade from the century-old Dillon Supply warehouse, for authenticity and to clad retail space at the base. And there were to be seven stories of offices atop nine levels of parking. The terrace blurs the lines between public and private, indoors and outdoors. “It’s a sky lobby, a symbol of the new workspace,” he says. “There’s a new generation in the workforce that’s less about the ceremonial and more about the experiential.” Brad Brinegar, CEO at Durham-based McKinney, can attest to that. Fourteen years ago, he asked Duda|Paine to design a new workspace for the next generation of his advertising agency on the American Tobacco Campus. The idea was to create a destination for the best talent and clients in the industry. Was it ambitious? You bet. Did it succeed? Absolutely. “They pushed us, but they were listening, to make our work better – and to make people’s jaws drop, 14 years later,” Brinegar says. “They know how a building elevates life.” For an architect, that’s the grail. And on the terrace of The Dillon in downtown Raleigh, Duda|Paine nailed it – literally and figuratively.